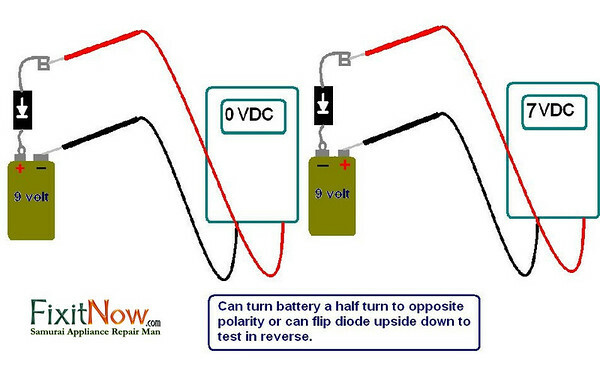 The HV rectifier (a nearly-scatological name for a diode) is one of the most common things to fail in a microwave oven. Fortunately, they’re pretty inexpensive and easy to install. The trick is in testing it so’s you can tell whether it’s good or not. Most multimeters just don’t pump out enough mojo to be able to break down the diode junction so you can’t test the rectumflyer, er, I mean rectifier directly with your meter. But this spiffy little rig will let you test it with just about any meter. This entry was posted in Microwave Ovens on August 26, 2010 by Samurai Appliance Repair Man.